Measure your life in takeoffs and touchdowns and you pick up some funky lessons. You come to memorize which airport terminals have yoga rooms because they’re the best places to nap through a flight delay. You have a favorite seat on a 757, another on a 737, and you even stop panicking in prop planes—those beer cans with wings that wobble with every gust like a fawn taking its first steps. You train yourself to keep pace with your home time zone, even if it means banging out a few hundred words at 3 a.m. on Oahu, before the sun flips the switch over Honolulu Harbor. Instead of counting sheep on a red eye, you teach yourself all the lyrics to Drake’s “Back to Back” and it stays in your head for five months until you exorcise it at a karaoke bar in New York City. 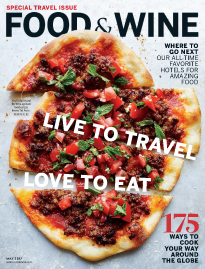 This is life on the road as Food & Wine Restaurant Editor, a post that’s taken me, over the past six months, across 37,000 miles and through countless dining rooms, all in the service of finding the year’s most captivating places to eat. These are turbulent times in America, and for the restaurant business itself. Revelations of harassment in high-profile kitchens have forced the industry into a long-overdue reckoning. So it felt exactly right as I hopscotched around the country, that the most resonant places offered more than unforgettable food. Yes, there was smooth chicken liver mellowed with Cognac, and bright green chermoula drenching silvery sardines, and an omelet so simple and fine and thoroughly French it could lead a séance for Paul Bocuse. But what struck me most was how many chefs seem to be reckoning with complicated notions of home and identity, untangling it all in beautiful ways on the dinner plate. Among the 10 restaurants you’ll discover in the Restaurants of the Year is Junebaby from Edouardo Jordan, a Florida-raised chef with Georgian roots, who was troubled by the lack of Black representation in the Southern food movement. His Seattle hit is as delicious an experience as it is an eye-opening one. Here, versions of poverty foods like chitlins and hog maw live alongside the more ubiquitous biscuits and pimento cheese, honoring the fraught history of Southern cuisine. At Reem’s in Oakland, California, I was moved by Reem Assil, a Syrian and Palestinian chef who uses food to cultivate understanding for the Arab experience in America. In Austin was another interpretation of first-gen life, from Texas-raised Japanese chefs Tatsu Aikawa and Takuya Matsumoto. At their izakaya Kemuri Tatsu-ya, they explore the role of smoke in both of the cultures that shaped them, conjuring an imaginary world where Tokyo cowboys slurp ramen noodles after quick-draw duels. In the end, the restaurants we fell in love with this year were the ones that delivered a rich portrait of the people who made them—where they’re from, where they’ve been, where they are now. On this journey of our own, they reminded us that we may be shaped by the things we pick up on the road, but there can be just as much power in finding a way to bring it all back home. Part of me wishes you could encounter Maydan the way I did the first time—poking around to find it at the end of a cobblestone alley in Washington, D.C.’s Cardozo neighborhood. You’d pass through a pair of heavy doors and then stand there in a daze, in everyone’s way, unable to compute how this copper-wrapped monolithic fire pit could possibly exist in a major metropolis. But there it is, in the center of a packed barroom, yawning 20 feet in the air and spitting ribbons of live fire. You might see chef Gerald Addison setting a basket of peppers over the smoldering coals, or his co-chef Chris Morgan hovering over the two tones—the Georgian clay ovens that hold steady at 800 degrees, churning out smoky, bubbled flatbreads at a swift clip. This fire is the heart and hearth of Maydan and the best things to eat pass through it. I filled every inch of my table with singed sardines marinated in vivid parsley chermoula, beef koobideh kebabs threaded with saffron, and a rich, wobbly hunk of lamb shoulder rubbed in Syrian seven-spice that I tore apart with my hands. To understand Maydan, though, you need to know the spitfire who made it all happen: restaurateur Rose Previte. She grew up in Ohio, the daughter of “an Italian guy from Jersey and a Lebanese-American mom straight out of Detroit who made damn sure I didn’t forget my own culture.” The restaurant is named for the public squares Previte encountered on her travels through Arabic cities and is designed to cultivate an energy she feels is missing in D.C.’s divided climate. “I want you to bump into people, to have to engage with strangers and find your way. I want to encourage serendipity and chance encounters,” she says. Maybe you’ll bump into Previte’s mom. The first time she visited Maydan, she jumped on the line to add more lemon to the toum—the thick, garlicky dip you’ll want to slather on everything. “An old Lebanese lady is never going to be like, ‘You’re doing everything right,’” says Previte. Chef Justin Yu has some opinions about what constitutes a sandwich. “Only something between two slices of fully detached bread,” says Yu. What about a falafel? “Not a sandwich,” he says. A hot dog? “Nope.” Yu’s hard-line categorization is particularly funny when you consider that his hot spot Better Luck Tomorrow thrives in a gray area all its own—the terra nullius between bar and restaurant. BLT is the love child of Yu and Bobby Heugel, the guy behind gold-standard cocktail destinations like Anvil. So you might feel like calling BLT your favorite bar. Heugel tinkers with the building blocks of familiar drinks, and he leverages Yu’s relationships with local farms to inspire weekly specials. That spicy Dark and Stormy? It’s made with house-fermented ginger beer derived from a random windfall of the root grown by Yu’s favorite chicken farmer. But you also might think of BLT as your favorite restaurant. The $99 “Cycle” buys one of everything on the menu, from gnarled lamb belly bites that eat like the world’s best chicharrónes to chilled shrimp dotted with Tunisian hot sauce. This all makes for a fun time, but there’s something slyly earnest happening here, too. BLT plants a flag for the kind of all-occasion neighborhood restaurant that’s hard to come by in a sprawling city like Houston. That means considering the neighborhood’s needs and filling in the gaps: Local pasta favorite Coltivare closes on Tuesdays, so BLT serves cacio e pepe and other pastas once a week to pick up the slack. It means finding a way to make a chicken salad interesting and delicious, so that people who don’t want to indulge in a “Party Melt” also will feel welcome. You should probably taste that melt though. It’s a perfect, loose grind of Texas beef cooked in tallow, served on bread that’s been crisped up with an outer layer of toasted cheese\. She's all things to all eaters, that New York City. Should a pressing need for Cornish hen arise at midnight or a thirst for a Shanghai soup dumpling hit at 4 a.m.—Gotham’s got you, friend. But when every night brings something new, every dinner has a learning curve, and every bar starts to feel like the place where nobody knows your name. But then Fairfax comes along, where restaurateur Gabe Stulman has made a home for you—yes, you—in New York’s West Village. You may be able to get anything at any time in this city, but for the moment, Fairfax is the only thing you want. There’s a well-worn leather sofa for that coffee meeting you’ve been meaning to take and a round marble table for dinner with the group of friends whose stories you know by heart. You could start in the morning with a grapefruit topped with hazelnuts, mint, and honey or an omelet so simple and thoroughly French it could lead a séance for Paul Bocuse (hat tip to chef Jack Harris). You could stick around until some friends show up and order a plate of salty anchovies or a soothing coq au vin. I'd ordered far too much already. I’d tried elastic man’oushe flatbread peeled off a hot saj griddle, sumac-braised chicken, shakshuka bubbling with bright egg yolks, and tahini cut with butternut squash. I hadn’t planned on getting the mu’ajinaat—the puffy little turnover stuffed with tangy marinated akkawi cheese and speckled with black nigella seeds. But a pair of older women at the Reem’s counter insisted I was missing out, told me they hadn’t tasted mu’ajinaat quite like this since their mother died, told me this particular mu’ajinaat was a taste of Palestine, a taste of home. The woman to thank here is Reem Assil, who grew up in a Syrian-Palestinian family in Sudbury, Massachusetts—an “ambiguously brown kid,” as she describes herself, in a predominantly white neighborhood. From an early age she understood food as a potent tool for empathy and connection. “When the Arab world appeared in our curriculum at all, it was always stereotypical and outdated. Kids would make fun of me,” she remembers. “My mom would come to the school and give the kids baklava and maamoul cookies. It always won them over.” As an adult, Assil studied international relations and became a labor activist; it wasn’t until a trip to Lebanon, where she observed the sense of community fostered in the lively bakeries of Beirut, that she resolved to bring that spirit to the States. Food as a vehicle for healing is at the center of everything here. Assil has roots in the local foods movement of the Bay Area—Reem’s started out as a farmers market stand. And so the produce is local, the meat from nearby halal butchers. The dough for those man’oushe breads gets its tang from a Tartine Bakery starter and may be topped with cumin from Burlap & Barrel, a company emphasizing ethical sourcing in Afghanistan, Palestine, and elsewhere. When Kevin Sousa began planting the seeds for Superior Motors—a community-driven restaurant in Braddock, Pennsylvania, an old steel town just a few miles east of Pittsburgh—he understood better than most what it could mean. Sousa grew up nearby. He knew his restaurant would be the first to open in Braddock in decades. It would offer job training and employment opportunities to locals. It would bring energy, heat, and hope, revitalizing this post-industrial borough. Superior Motors was a big idea. And big ideas take time—in Sousa’s case, five years. In 2014 he set a Kickstarter record for the most-funded restaurant campaign, raising $310,225. But then construction costs built up, and the money ran out. The project seemed to founder. Finally, last spring, there were signs of life: an Instagram photo of a brick hearth; another of new kitchen equipment. Funding came through, and on July 15, 2017, Sousa opened the doors to Superior Motors, a poured-concrete temple built on the bones of a former Chevy dealership on Braddock’s main drag. Five years is a lifetime in the restaurant world. Ideas can change. Good intentions can sour. But the Superior Motors of today is the restaurant Sousa promised Braddock it would be. Thirty-five percent of his staff are Braddock natives. He closes the restaurant on Mondays and Tuesdays to lead a job training program focusing on foundational topics like knife skills. Much of the produce starts out as seedlings in the rooftop greenhouse that are replanted at Braddock Farms down the street. Seeing the place in full flower can be an emotional experience. The glass-fronted space faces the steel mill across the street, and cloudy gusts from its old smokestacks remind you exactly where you are. You might spot engraved black steel cards in the hands of many guests—they’re good for a 50 percent discount any time, and any Braddock resident can get one. Taste a simple halibut seared off in the gut of the hearth or a juicy slice of pork loin cut with trout roe’s salty pop, and you’ll see Superior Motors as a very good restaurant. Look a little deeper, and you’ll see it as something even richer: a testament to the power of persistence, of stamina, of keeping a white-knuckle grip on ideals, even in the most challenging moments. Let's start with a few markers on the timeline of the long and storied life of Grand Cafe. The massive gas oven was installed in 1951 when the space was a community bakery. In 2003 the Grand became a proper restaurant. A few years later, blues pianist and local legend Cornbread Harris knotted his tie and showed up for his first gig playing piano here. In 2014 Minnesota native chef Jamie Malone came to the Grand on a date, warming up by that toasty Despatch Baker Boy oven. “I remember thinking there was something so sweet, cozy, and romantic about it,” she says of the charming bistro, occupying a quirky warren of rooms in southwest Minneapolis. “I also remember thinking, ‘God I wish the food was better.’” In 2017, Malone bought the restaurant and turned it into the Francophile fever dream she knew her hometown deserved. Sometimes, a girl’s got to grant her own wishes. The Grand Cafe of 2018 preserves the soul of the original: Decades later, the gas oven still fires like a dream, and at 91, Harris still plays at the Grand Cafe every Sunday night. But there are also Malone’s gentle tweaks, which elevate the old girl: You might drink en rama sherry instead of Burgundy beneath the hand-painted palm frond wallpaper. You can now wave down a roving marble cart set with a rich, nutty Tennessee ham. When Jennifer Jackson's phone lights up with a text, it’s a buddy asking her to save a seat at the bar. Then it’s Dave Belanger, the trusty clammer she and co-chef Justin Tootla count on for their usual order: Charleston oysters packed in a Coleman and insulated with frozen Gatorades. A few minutes later, it’s another purveyor, sending a heads-up that he’s short on Nantucket scallops. This is a typical day at Voyager, a seafood gem in Ferndale, Michigan, a small industrial sector of Detroit. Voyager breaks the mold of your classic oyster bar (the usual shucked suspects; a musty imperial vibe) and looks good doing it. Restaurateur Eli Boyer built the place on his own terms, in a way that felt right for his hometown. A color-blocked, airy interior makes it the ultimate hangout, and Tootla and Jackson’s menu makes it a compelling destination. The oyster selection ranges from Barnstable, Massachusetts, to Discovery Bay, Washington, but the best bites at Voyager reach further afield. Peel-and-eat shrimp are dusted with Old Bay and served with umami-packed Alabama comeback sauce. A Caesar salad arrives with creamy, crunchy fried sweetbreads. "John Wayne on acid." That’s Tatsu Aikawa’s shorthand for Kemuri Tatsu-ya, the Austin izakaya he heads with co-chef Takuya Matsumoto. Look around, and you’ll see his point. The restaurant conjures a world where cowboys slurp ramen after quick-draw duels—a Texas roadhouse by way of Akira. To make the two worlds work on a menu, Aikawa and Matsumoto considered their own experiences. “We come from Japanese immigrant families, but we both grew up here in Texas,” says Aikawa. “We wanted to tell that side of our story through food.” They settled on smoke as the common thread: Smoldering post oak is the heart of Texas barbecue, while smoked bonito powers dashi, the base of many Japanese recipes. There's a painting that hangs near the restroom at JuneBaby in Seattle, a silhouette in a ring of fire. Look a little closer, and you’ll notice the texture lacing down the figure’s back: scars. “I wanted people to take a moment,” says chef Edouardo Jordan of the piece, an interpretation of a famous abolitionist photograph of a slave. This isn’t the only art setting the tone at the restaurant. There’s a mural of live oaks dripping with Spanish moss and a festive vignette inspired by the work of African-American artist Jacob Lawrence. Taken together, these illustrate Jordan’s intention at JuneBaby. “I wanted to present Southern food from a black chef’s perspective—to present the good and the bad, the stereotypes and the reality,” he says. It’s a complex and confronting narrative that Jordan, a Florida-born chef with Georgia roots, handles with a lot of care. At JuneBaby he delivers the message using a universal language: thoughtful, delicious food. Here are dishes that have been left out of the boom in Southern-inflected restaurants. Chitlins, for example—the small intestines of a pig, stewed and finished with housemade hot sauce. “That’s what my grandmother cooked because that’s what she could afford,” he says. “The question is, how do we elevate these things to a degree without compromising tradition?” The answers are here on the plate: Pig ears arrive in crunchy ribbons tangled up with watercress over dabs of honey-sweetened pecan butter; pillowy antebellum buns are perfect for sopping up rich consommé beneath braised oxtails. JuneBaby is resonating. The place is perpetually packed with locals and destination diners who come for Jordan’s flaky biscuits with sweet cane syrup or his chile-tossed jumble of charred okra and peanuts. On Sunday nights, they queue up to score one of just 60 orders of his fried chicken, tart from a buttermilk brine, with exactly the right ratio of juicy meat to crunchy crust. Linger on a barstool long enough and you might find yourself locked in conversation with a stranger, swapping passages from the encyclopedia Jordan compiled—the entries range from the West African slave trade to the history of the Bradford Watermelon. I like to think I'm pretty conversant in Filipino food. I know sisig from lechon, longganisa from lumpia. And I’ve watched with excitement as the cuisine, a rich and complex brew of Chinese, Spanish, and Pacific flavors, embarked on its rise through the restaurant world. But in that time, I can’t say I’ve encountered anything quite like the beef kilawin at LASA in Los Angeles. It had the satisfying texture of a bistro tartare with a funky hum I couldn’t put my finger on. I’d learn later that it was the Filipino fish sauce known as patis swirled into the aioli that bound it all together. And those crunchy bits on top, with that twang of acidity, those were salt-and-vinegar taro chips. This is the kind of opening salvo that makes you giddy for whatever’s coming next—and, vitally, when a menu covers so much new ground, it’s the kind of dish that earns a diner’s trust. Brothers Chad and Chase Valencia (chef and front-of-house, respectively) are native Angelenos who have been working through the city’s kitchens and dining rooms since they were teenagers. They first conceived of LASA as a series of pop-ups and eventually landed in this humble little space in Chinatown. The walls are a deep green, a nod to the color of a museum in Pampanga, the Filipino province where the Valencias’ parents were born. Take a walk around and you’ll spot plenty of snapshots of the elder Valencias. These are intimate touches that tell you LASA is a deeply personal place—an album of memories, an heirloom. But to assume LASA is as frozen in the past as an old photograph would be a mistake. “We are doing something uniquely American, applying the food of our upbringing to the evolving narrative of cuisine in the U.S.,” says Chad. And so LASA delivers food with a foot planted confidently in both worlds. Never had kesong puti? LASA’s a good place to get to know the mild white cheese. Chad models it on an Italian ricotta, curdles the milk with Filipino calamansi, and crisps it up in brown butter like gnocchi Parisienne. His knack for merging Western technique and Filipino ideas hits a high note in his tinola, a traditional chicken soup reimagined as a duck leg confit. It sits in a broth of lemongrass and young ginger, drops of duck fat–chile oil drifting around on top.